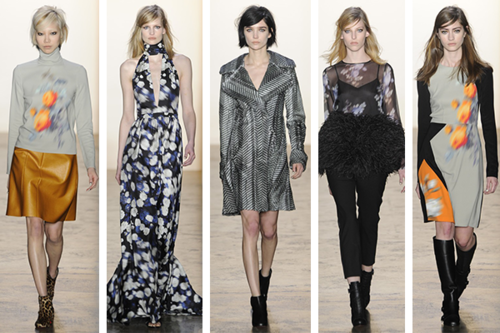 For Fall, Peter Som had a bit of everything to offer. 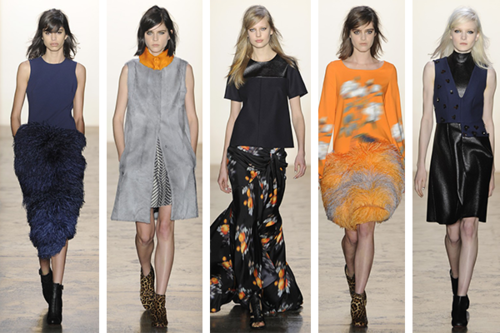 The many looks included something playful (row1, looks 1 + 4) + something dressy (row 3, look 2). 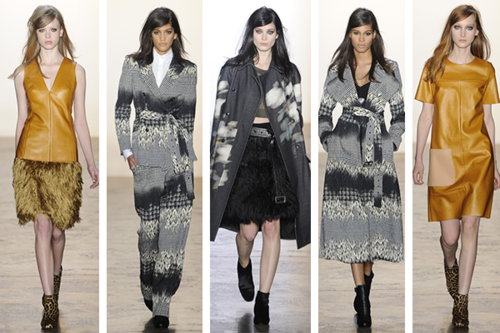 But what really stood out for me was how movement + pattern proved to be key to this collection. Movement was present in skirts + peplums out of ostrich feathers that moved while the model strutted down the catwalk (row 2, look1) but, even more fabulous was how it was also in a lot of the patterns that looked blurred (row 4, looks 1 + 5). If you didn’t know any better, you would think the model’s body moved too fast while the rest of her stood still, thanks to the blurry patterns. As for the other patterns in the collection, there was a lined pattern on a fur coat (row 3, look 3) + a floral pattern that disintegrated into grey, back to florals, into black then into plaid (row 2, look2 + 3).